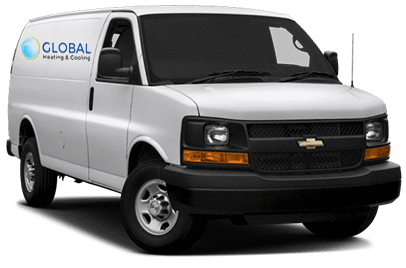 If you have a radiator in your home that is not working correctly, the industry professionals at Global Heating & Cooling can help you diagnose the problem. Radiators have been used since the 1850's as a solution for home heating, and there are many different kinds of radiators out there that all operate just a little bit differently. Whether you have a hot water radiator, a steam radiator, or a baseboard radiator, we can help you with any repairs and services needed. Radiator Not Heating Properly - If one part of the radiator, or more, is not heating the way that it is supposed to, it could indicate that there is air trapped somewhere in the system. Noisy Radiator - If your radiator is making noises that it did not previously make, this could point to a problem with the entire central heating system or air coming in from the expansion pipe. Radiator Rusting - If your radiator is rusting, do not ignore it! Rust can definitely impact radiator functioning and lead to a decreased lifespan. If you notice rust it is important to address the problem as quickly as possible. Radiator Too Hot - A radiator that is too hot could indicate a problem with the thermostat or the radiator valve, among other things. Seek professional input right away to avoid a fire risk or burns. If you find yourself wanting to upgrade your home heating to a solution that is more energy efficient, we offer a variety of selections such as furnaces, boilers, heat pumps, and radiant floor heating. Call Global Heating & Cooling at (773) 801-3734 and let us know what is going on with your radiator. We are here to help you! We wave our trip charge for any repair over $150!